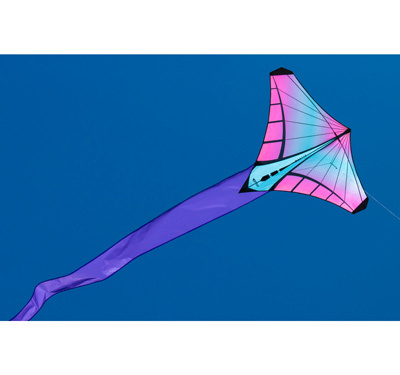 The Mantis Iris single line kite stands out from the crowd with a unique shape and stunning graphics. A broad wingspan and long tail celebrate your place in the landscape with a bright flying sculpture visible from a mile away. With the aerodynamic qualities of both a diamond and a delta kite, it's simple to assemble (just connect three rods) and packs into a light, compact sleeve for travel. The kite comes with an easy-to-use hoop winder with braided polyester flying line for long life and minimal tangles and measures 48"x34".